What is the best current hotel loyalty offer? What are the best hotel promos for October? Welcome to our regular round-up of the best hotel promotions currently running. We didn’t run this feature during September as all of the main chains were switching their offers during the month, but now we have a clear run where you can plan more easily. All of the information in this article can also be found on our ‘Hotel Promos’ page which contains details of all of the current offers, together with links to our major articles on each hotel scheme. However, a positive response from readers – especially our 12,200 email subscribers – means I am now running this monthly article as a handy summary of what is going on. Where should you credit your stays in October? It’s all change for October. IHG, Hilton, Accor, World of Hyatt and Marriott / Starwood have new offers which will run until the end of the year. We also have an EXCLUSIVE HFP Marriott offer for weekend stays across Europe (details here)! Hilton’s offer is the easiest – double points (triple on luxury and resort stays) with no restrictions. Marriott / Starwood are offering 2000 bonus points per stay but you must stay 2+ nights, and if you are at expensive hotels the bonus looks a little puny. Accor and World of Hyatt are offering bonuses which build as you stay more, so you will need to commit to a lot of nights to really start seeing value. Even IHG’s double points offer has a catch this time, as it only kicks in from your 2nd stay. This could still be the most generous offer but it depends on your personalised targets. The only chain to avoid if you are seeking bonus points is Radisson Rewards which isn’t offering any promotion. IHG has pulled back a little this quarter which is a shame. However, because everyone gets personalised targets, you may be pleasantly surprised. The new offer is called Double Points Plus More. It runs from 16th September to 16th December. It is simple. You earn double base points from your 2nd stay, up to a maximum of 15,000 bonus points (which needs $1,500 of spend). There are additional personalised targets which could be worth a lot more. This is my article on the offer. You can register on the IHG site here. 6,800 bonus points for making four bookings using the corporate code of the firm I haven’t worked for since 2010! This is fairly useless to me, frankly. To hit 15,000 base points would require spending $1,500, before VAT, on IHG stays over the next three months (plus the spending on the first stay, which won’t be doubled) and that isn’t happening. The 11,200 points bonus for staying at two different brands is an easy one, however. If I value an IHG point at 0.4p then I’m getting £45 of points back from those two stays – plus double base points on the 2nd stay – which is a good deal. Again, this is not hugely exciting. However, 11,200 points for two brands is straightforward enough, as is the app bonus. You need to register for ‘Double Points Plus More’ – the link is here where you will also find your personalised targets. The IHG home page is here. The Hilton offer is very straightforward. You will receive double points on every stay from 10th September to 3rd January. There is no minimum stay required and every Hilton hotel is participating. Even better, stays at luxury (Conrad, Waldorf) and resort hotels earn triple points. I wrote about Hilton’s double and triple points offer here. Hilton is still status matching too. If you have status with another hotel programme, Hilton will match you to Gold or Diamond for 90 days – I explain how to do it in this article. You MUST register for the double and triple points offer by visiting this page of hilton.com. The Hilton booking page is here. You should also register for the Hilton / Lufthansa offer which gets you 2,500 Miles & More miles per Hilton stay until 31st October. This is on top of your standard points so there is NO EXCUSE for not signing up to this too, especially as I’d value the miles at £25 if you can get enough for a long haul redemption. Full details are here. Le Club AccorHotels, the loyalty scheme for Ibis / Novotel / Sofitel / Mecure etc, is running a generous offer. You can only maximise it if you can book well ahead and if you tend to stay 2+ nights on average when you travel. Called “The Reward Days”, you will earn €120 of Accor hotel vouchers or 6,000 Avios (or a variable pile of other airline miles) if you complete three x 2-night stays at Accor properties between 18th September and 14th January 2019. You must book your stays between 12th September and 7th October. Existing bookings do NOT count. These need to be cancelled and rebooked. Accor points are worth a fixed 2 Eurocents each in credit towards a hotel room or 1 Avios, assuming you credit them to Iberia Plus. You can move them to BA later via ‘Combine My Avios’. My full article on “The Reward Days” is here. You can register via the offer website. Following the merger of Marriott Rewards and Starwood Preferred Guest on 18th August, the two companies are now operating as one even though the individual brands will remain until January. The current offer is called ‘MegaBonus In More Places‘. It runs from 26th September to 31st January, although registration closes 7th January. Given that Marriott / Starwood now covers all of these brands – AC Hotels, Aloft, Autograph, Courtyard, Delta Hotels, Design Hotels, Edition, Element, Fairfield Inn, Four Points, Gaylord, Le Meridien, Marriott, Protea, Renaissance, Residence Inn, St Regis, Sheraton, The Luxury Collection, The Ritz-Carlton, Springhill Suites, Towneplace Suites, W, Westin – you won’t be struggling for places to stay. Our main article on MegaBonus In More Places is here. You can register for the promotion here. The main Marriott booking page is here. Don’t forget our EXCLUSIVE Head for Points Marriott deal! We recently launched an exclusive HFP promotion with Marriott, offering 10,000 bonus points when you book a weekend stay which includes a Thursday or Monday night. This offer runs in addition to the current Autumn bonus points promotion. This special HFP bonus is on top of your standard points, any elite status bonus AND the 2,000 bonus points you would earn from the ‘MegaBonus In More Places’ offer. The promotional code you need to use on the Marriott website is MR6. The rate you get should be the same as the cheapest available generally, eg the Member Prepay and Save rate. You need to book by 9th October for stays until 31st March 2019. You can earn a maximum of 100,000 bonus points from this promotion. More information about this special offer, together with a booking link, is here. Radisson Rewards is not running a global promotion at present. 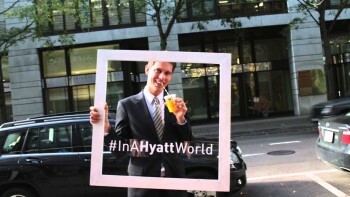 World of Hyatt has a new promotion which allows to you earn up to 60,000 bonus World of Hyatt points. It runs from 1st September to 30th November although registration closes 15th November. I value a World of Hyatt point at 1p, so you’re looking at £15 per night in bonuses if you hit the full 40 nights. You are only getting £5 of bonus points per night if you can only hit five nights, however. My full article on the promotion is here. You can register for the offer here. PS. If you booking a luxury hotel, remember that we can offer you exclusive additional benefits at Four Seasons, Mandarin Oriental, Peninsula and similar hotels. Click here for details of our luxury hotel booking service in association with Bon Vivant / Virtuoso. Feedback from readers who have used this service so far has been excellent and we have booked over £820,000 of rooms so far. O/T – my wife has 9,416 of Virgin Atlantic Miles due to expire, and we aren’t able to fly before they expire. It seems that you need at least 10,000 miles to transfer to another programme. I’ve got 70,000 miles but don’t want to pay £82.50 to transfer hers to me! Any ideas of how to use these before they run out? Any ideas much appreciated! 1k transfer in from Amex and then move to a hotel scheme? She doesn’t have an Amex – or any other points cards for that matter. I’m the collector, she just got these on our honeymoon and never used them. She won’t sign up to a credit card just for these. You could buy 1,000 – not sure of the cost but it would be less than the value of 15,000 Hilton points (£50) or 10,000 IHG points (£40).